Today it’s back to the book that prompted the creation of Sonderling Sunday, Der Orden der Seltsamen Sonderlinge, known in English as The Order of Odd-Fish, by James Kennedy. Last time, we left off on page 280, Seite 355 auf Deutsch, with Jo working in the library. = Die Archive des Ordens der Seltsamen Sonderlinge waren erst kürzlich der Öffentlichkeit zugänglich gemacht worden. I think my favorite phrase today was seine Bleistifte spitzte. I’ll remember it when I answer Fragen der Öffentlichkeit. Houghton Mifflin Harcourt, October 4, 2016. 44 pages. 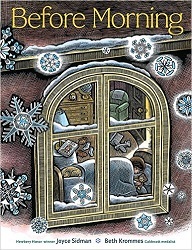 Here’s a beautiful book for children who wish for snow. I’m not absolutely sure parents will want to encourage this kind of wishing, but the book is so gorgeous – with award-winning Beth Krommes’ art more beautiful than ever – and gives such a sense of peace and well-being, I think it’s worth it. How powerful are words? Can they make things happen? Stop them from happening? Can they protect us? Comfort us? Enchant us? This book is written in the form of an invocation — a poem that invites something to happen, often asking for help or support. Humans have been using invocations for thousands of years, to soothe the body and strengthen the soul. Do they work? Maybe. Maybe speaking something out loud is the first step toward making it happen. What is it you wish for? Find the best words for that wish and speak them aloud. Maybe, in the deep woolen dark, snowflakes will begin to fall . . . 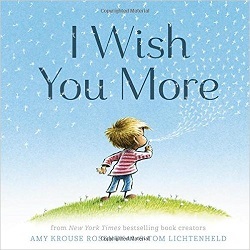 The wish expressed in this book is for snow to fall before morning. But oh, the beautiful words used in the invocation! And the lovely pictures! The pictures tell the story of a mother who’s a pilot. Since her plane is grounded, she gets to come back to her family, and mother, father, and child go sledding together in the delightful white world. 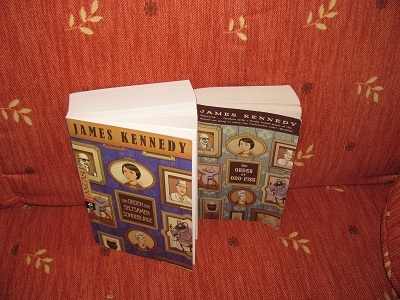 As I said, there are only 66 words in the main text, and they are slowly distributed through the pages. They are well-chosen words, coming from a poet. let the sky fill with flurry and flight. I’m tempted to quote the entire text – it’s so lovely – but I don’t want to give the impression that you now know what’s in the book. This book is an opportunity to talk about wishes as well as a chance to treasure the beauty that snow brings. And who knows? Maybe the wishing will work. Source: This review is based on a book sent by the publisher to my co-worker. Groundwood Books, Toronto, 2015. 48 pages. I’ll admit that this is a message book. But the message is in the background, which makes it palatable. The story is of a little girl who is traveling with her dad. I count what I see. At first the things she sees are normal barnyard things. I thought it was a counting book for a little while. Then we see them cross a river and we see people camping out. who live by the train tracks. And if I get tired, I look up and count the clouds. I learned to count to one hundred. It’s not until the spread after that that we realize she and her dad are on top of an old rusty train car themselves. Sometimes, when I’m not sleeping, I count the stars. There are thousands, like people. And I count the moon. It is alone. Sometimes I see soldiers, but I don’t count them anymore. There are about a hundred. There is lots of symbolism in the pictures, including in toys and in animals along the way – notably a coyote and two white rabbits. There are many spreads without words, including the final pages. The story of their journey doesn’t really finish. We see a long fence, a desert, and two white rabbits. The father and daughter in this book are leaving their home and the world they know and love to go to a different country. Maybe it is because the father cannot find work and a way to support his daughter at home. Maybe because the world they live in has been destroyed by violence, war and danger. We don’t know. What we do know is that millions of people around the world become refugees every year. In North America, close to a hundred thousand children from Central America make the very dangerous trip you see here to try to find safety and a way to survive in the United States. Coyotes, people whom they pay to “help” them make the trip, often betray and abandon them. And when they finally make it to the border, they might be turned back or arrested. Many of the children who come to the United States alone are sitting in American detention centers along the Mexican border waiting to hear their fate. What do those of us who have safe comfortable lives owe to people who do not? I admit, I would dearly love to try this book on a grumpy toddler. Though I’m not sure I ever again want to be responsible for a grumpy toddler. Perhaps if you read this to a toddler when they are not grumpy, they would gain vocabulary for talking about the sensation. Penguin was in a bad mood. and kicked off his grumpy boots. But he was still grumpy. He tried to shake it off. Penguin continues to shed his grumpy clothes, piece by piece. Finally, he took off his grumpy underpants. But then he counts to three and splashes into the tub (over quite a few pages). The water was nice and cold. Penguin played with his duck. He hid under the water and made himself a bubble beard. Little by little, he was starting to feel much better. I think this gives you the idea. The illustrations are simple stamped-ink linoleum printing on a white background. After his bath, Penguin has a cozy bedtime routine including reading his favorite book, Learn to Fly, and finding his favorite Teddy. because all the grumpiness had been washed away. There you have it. Quiet. Simple. Delightful. 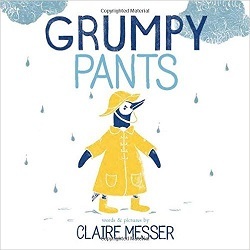 Now, I noted after the fact that since this is a British author, they probably should have changed the title to Grumpy Underpants. They obviously did change the inside text, but perhaps didn’t want the book to have a different title than in Great Britain. Anyway, when Penguin takes off his grumpy underpants, that’s sure to get a giggle. Of course, the brilliant part is that there’s nothing problematic about displaying a naked penguin on the pages. So, if you’re a parent whose child ever has a bad day – think about introducing the idea of washing grumpiness away! Come to think of it, I may try that myself the next time I have a bad day. There’s something extremely satisfying in the thought. And it might help coax them into the tub as well. Definitely worth a try! Abrams Books for Young Readers, New York, 2015. 40 pages. Here’s a book that’s brilliant for beginning readers, but also for small children who don’t read yet at all. This is a mostly wordless book – the story is told through pictures, and the words merely label things. 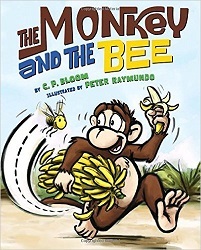 The pictures show the bee fly onto the banana and get flicked off – but the bee comes back just as the monkey is taking a bite and buzzes in the monkey’s mouth. The monkey spits out the bee, but gets mad and picks up a branch to swat the bee. Unfortunately, he ends up swatting The Lion. Hijinks ensue and eventually it’s the bee who helps rescue the monkey from the lion. The monkey decides to share the banana. The story as I just told it here is nothing particularly special. It’s the large close-up illustrations with so many action shots that make this book a winner. There is so much to talk about with little ones – and even toddler listeners will understand what’s going on and quickly learn what the print words are saying. I used this book in a toddler storytime, and it was a huge hit. Lots of audience reaction! The expressions are large and even toddlers understand the emotion. And the happy ending leaves everyone feeling good. Source: This review is based on a book sent to me by the publisher for Cybils judging. Grand Central Publishing (Hachette), 2016. 288 pages. This book is magnificent! Now I really need to figure out a way to get to see the musical. The book itself has wonderful material added to the text about the musical. It includes the complete libretto, with large photographs. Most pages of the libretto, in fact, are superimposed over or printed next to large format photos of the actors singing that particular song. 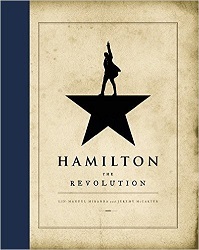 The libretto is peppered with notes from Lin-Manuel Miranda. They tried to include these things in the audiobook. There are two “additional” CDs. One includes pdf files – of the libretto, perhaps with photos. (I didn’t check.) The other is Lin-Manuel Miranda reading the notes. But since the notes are simply read – out of context, not in place in the libretto (Presumably where they go on the libretto is in the pdf.) – you’re going to want to read them, anyway. Now, I had listened to the first two CDs before I went on vacation. While in California, my sister played for me the wonderful cast album, which gave much more context to what I had listened to. When I got back, my hold came in on the print form of the book – and I learned that the words of the songs are all written out – right next to the information about writing and casting that song. So I switched to the print form and read the words to all the songs, with notes and with pictures, in the right order along with the chapter about writing that song and what it meant in context. The story of writing and casting the musical and all that it means in America today and why it’s such a phenomenon is the subject of this book. Here’s a section from the Introduction where Jeremy McCarter explains the plan of the book. The story is fascinating – both the story put into the musical and the story of the creation of the musical. I have now also placed a hold on Ron Chernow’s biography of Hamilton, which inspired Lin-Manuel Miranda. He walked into a rehearsal studio in the Garment District and was, by his own admission, “shocked” by what he saw. The men who were going to sing the roles of Washington, Hamilton, and the other Founding Fathers were black and Latino. Not being a rap listener, Ron hadn’t given much thought to the fact that the people best able to perform the songs that Lin had been writing might look nothing like their historical counterparts. Within five minutes, Ron was carried away by what he heard. He became what he calls a “militant” defender of the idea that actors of any race could play the Founding Fathers. Just having all the words of the songs is by itself a reason to get the book – because the songs are packed with information. Having read the whole thing, I’m planning to buy myself a copy of the cast album and listen to it all again – I will catch so much more. There’s all kinds of background information here about casting the show and putting it on, but one of my favorite chapters was about special performances they did for local high schools – and the energy that the teachers harnessed and brought back to the classroom. They included some exciting stories about the students engaging with the material. Then they ended the chapter talking about what will happen when Hamilton is licensed to be performed in schools. Its subject matter will appeal to history teachers, its array of juicy roles will appeal to young actors, and its mélange of musical styles will appeal to almost everybody. In a given school year, they imagine, that might mean 600 or 700 student productions around the United States. The book is framed by two performances for President Obama, and there are reflections at the end that communicate part of why this musical is so inspiring. Unless Lin made the whole thing up – and nobody has said that he did – it suggests that however innovative Obama’s speeches and Lin’s show might seem, they are, in fact, traditional. They don’t reinvent the American character, they renew it. They remind us of something we forgot, something that fell as far out of sight as the posthumously neglected Alexander Hamilton, who spent his life defending one idea above all: “the necessity of Union to the respectability and happiness of this Country.” Obama’s speeches and Lin’s show resonate so powerfully with their audiences because they find eloquent ways to revive Hamilton’s revolution, the one that spurred Americans to see themselves and each other as fellow citizens in a sprawling, polyglot young republic. It’s the change in thought and feeling that makes all the other changes possible. The Obama presidency will end in January 2017, but the show that shares so much of its spirit will keep running. At the Rodgers that night, the president all but anointed Hamilton as a keeper of the flame. His “primary message,” he said, was to remind people of the need to keep hoping and to work together, but “this performance undoubtedly described it better than I ever could.” The most important affinity that Hamilton will carry into its future isn’t a specific message, though, political or otherwise: It’s an underlying belief in stories, and their power to change the world. Good community organizer that he is, the president knows that stories can be an engine for empathy, and a way to show people what they share. It’s why he introduced himself, in that first big speech in 2004, by telling his own story. In the years to come, some of the many, many kids who are going to see and even perform Hamilton will be newly inspired to tell their stories too. Every time they do, the newly kaleidoscopic America will understand itself a little more. Lee & Low Books, New York, 2015. 32 pages. 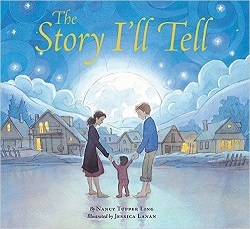 You couldn’t ask for a more beautiful book for families who have adopted children to provide a context for telling their own adoption story. 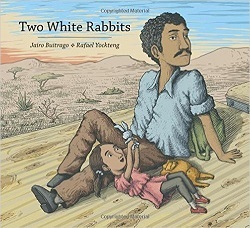 This book, with lovely watercolor illustrations, is about a brown mother and white father who have adopted a baby from China. What follows are several fanciful scenarios, which all slip in how loved this child is. Wrapped in her arms, you followed a trail of lanterns around the world until you reached our doorstep. I’ll always wonder how she picked our home. We don’t have fancy gates or marble stairs, but she found the perfect place for you. How your eyes sparkled when I first saw you. Sometimes the stories are quite simple, and sometimes very imaginative. Perhaps we were walking on the beach at night, and you floated in on a wave. No, not a wave! I’d say there was a dragon queen who kept you by the sea to raise you as her own. I heard cooing sounds calling to me. I waited until the dragon queen fell asleep. Then I tiptoed inside and rescued you from her dark cave. But she finally gets to the real story. “Not true!” you’ll say when I tell these tales. And I’ll smile, because it will be hard to fool the brightest child in the world. This is simply a lovely choice, especially for adoptive families. This sequel to The Great Greene Heist can be enjoyed on its own, though why limit the fun? 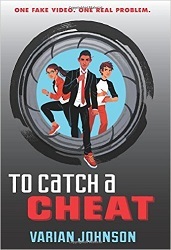 The first book explains how Jackson Greene’s team was assembled, but other than that, you can go on with the story in To Catch a Cheat. Jackson Greene keeps trying to give up running cons. But someone has hacked the new security cameras at school, backed up the toilets and flooded the school — and faked footage of Jackson and his team doing the deed. Their terms: Steal the key to Mrs. Clark’s legendary end-of-term exam, or the fake video footage will be turned over to the principal. The principal doesn’t trust Jackson, so he won’t wait for them to prove the video was faked. What’s more, they have to include two of their opponents in the exam heist. But Jackson and his team are pretty sure those two aren’t the real mastermind behind the plot. Who has it in for Jackson? And how can they get the fake video without letting anyone get away with cheating? I’ll be honest — I’m not sure I followed every step of the elaborate plan Jackson and his friends worked out. But I definitely enjoyed the journey. Again, To Catch a Cheat has a multicultural cast and realistic middle school students — smart and tech-savvy, but definitely still kids. Jackson has patched things up with Gaby de la Cruz and is spending a lot of time with her, but now the caper he’s having trouble planning is when to kiss her. More good-natured fun and cleverness. What could be better? Elaborate plans for a team to break into school and steal a test — but also work it out that the cheats are the ones who get caught. Can they pull it off? Who better than Jackson Greene? He’s trying to stay retired, but what can a con artist do when he gets framed? Disney Hyperion, 2016. 198 pages. Here is some consolation that the series of books about Clementine has finished. We don’t have to totally say good-by to Clementine, because now we can get to know Waylon. 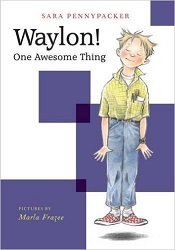 Waylon is Clementine’s classmate, and now they are in fourth grade. Sara Pennypacker is a genius at dramatizing child-sized concerns. Waylon is a budding scientist now navigating things like a leader in his class dividing everyone in the class into teams. And his teenage sister Charlotte has changed her name to Neon and wears nothing but black. Then a kid from last year is back – and he looks like trouble. Which team will they put him on? Waylon doesn’t like the idea of teams, but he still finds he wants to be put on a team. He’s got a problem with blurting out scientific facts that seem exciting to him. Waylon gets a journal where he can write down his awesome ideas. Soon a cause comes up that seems worth all his energy. Will it bring the class together? I just don’t find it in me to be quite as big a fan of Waylon as I am of Clementine, but I strongly suspect he’ll grow on me. And I’m glad that there’s something more, but a little bit different, for fans of Clementine. I like Waylon’s family almost as much as I like Clementine’s family. His mom is a scientist with a lab. His dad is a writer who often does acting in the park on Saturdays. On the Saturday we see, he’s posing as a living statue of Ben Franklin who moves suddenly and surprises people. Waylon learns useful things from watching him. Waylon . . . took off to find a good place to play Want This Dog? Waylon stretched out on an empty bench with a view of the park. He would never have a dog – ever – because his mother was deathly allergic. But that didn’t mean he couldn’t pretend. Whenever a dog went by, he imagined that its owner was trying to give it away. No thanks, he imagined himself saying to a woman with a poodle. Too fluffy. No, he thought when a teenager tugged a Saint Bernard past his bench. Too slobbery. Playing Want This Dog? Made him both sad and happy at the same time. It hurt to see all those dogs he could never have. The truth was, he would have loved to take any of them. Still, it made him feel strangely happy that in all the times he’d played, he had never imagined himself answering Yes. If he didn’t know better, he could believe that the perfect dog – the one meant just for him – was waiting out there. But waiting for what, he couldn’t imagine. Once again, I like the way Sara Pennypacker brings all the disparate threads in Waylon’s life together, in a completely satisfying, but realistic, climax. You are currently browsing the Sonderbooks blog archives for August, 2016.